For 2019, I have set myself a goal of 10 races, from 5k to full marathon, on 4 different islands. Submitted as a competition entry to Runners World magazine. Based on one stage of the Marathon Des Sables. I stumbled up and over the last sandy bank and saw stretched in front of me a rock-strewn plateau. Flat ground at last, a chance to get back into a running rhythm. But the rocks were quite large and the chances of turning an ankle over were high. I paused at the foot of the bank - were the rocks spaced far enough apart for me to pick a way through without slowing to a walk? As I looked ahead for the answer I felt something moving across my feet. I froze. 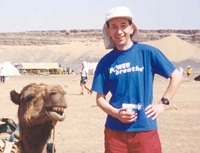 I was running a marathon in the Sahara Desert and the organiser's insistence that we all carry an anti-venom pump hadn't been an encouraging omen. Glancing down I was relieved to see that the two-foot long lizard didn't appear to have noticed that he'd just crossed a pair of size 11 trainers rather than yet another rock. As it sought shelter from the blazing sun under a pile of desert rubble I breathed a sigh of relief and sent a message to my legs - start running. Either the message didn't get through or my legs were becoming mutinous for there was no response to the command. This was a marathon like no other. Stage five of the Marathon des Sables covers the classic distance, 26 miles and 385 yards, but there are no tarmacced roads, mile markers or cheering crowds. It is a duel under the sun, the desert throwing down the gauntlet. Normal practice for a marathon is to taper down your training in the run-up to the race. Well, we tapered up. The previous four stages had seen us run 18½, 20, 23 and then 46 miles on consecutive days. We had been allowed two days to complete stage four, and crossing the finishing line shortly before one in the morning had given me the luxury of a day off to patch up my blistered feet. Now, standing waiting beneath the start banner, another mantra of the marathon slipped through my mind - don't set off too fast. You had to be kidding; the first nine miles of our run today was through the Chebbi Erg, the second largest range of sand dunes in the world. That should put a brake on overenthusiasm. Trois, deux, un, allez! We were off again and immediately every footfall was being sucked into the soft sand. Twenty minutes later and I was in another world, menacing but so beautiful. Bulwarks of soft, powdery sand soared hundreds of feet into the air as far as the eye could see, sculpted into perfect curves and basins by the busy desert wind. Following the razor sharp ridges was the way to progress. Miles of sand to the right, miles to the left, but we advanced in single file for to step on to the downslope meant an inevitable slide to the depths and another Herculean climb out. The heat of the sand burned through the soles of my shoes, the sun bore down from above; a glance at the thermometer on my backpack showed the red liquid nestling into the overflow bulb above 50oC. The sand that packed into my shoes and socks ground remorselessly at the wounds on my feet. It was a cauldron, it was Hades, but as we sucked in the hot air and pushed onwards and upwards, it was also a privilege to be there. Panoramas that few people ever get to see, pitting yourself against the full repertoire of desert perils, the experience was so uplifting that it took me above and beyond normal reactions to pain and exhaustion. Three hours had passed when I emerged from the dunes. Three hours, and I had only completed a third of my marathon, but from here to the end our route sounded more encouraging - sandy, stony plateaus, dried river and lake beds - surely an opportunity to make up for lost time. A few minutes and one reptilian encounter later, the ground was indeed flat. So flat you could see for miles - and miles and miles and miles. Endless miles of emptiness - a searing void. The desert seduces you with immeasurable beauty and then, in the space of minutes, it rips away the vista and presents an expanse so vast and empty that there is nothing, absolutely nothing, that will distract your mind from the relentless task of putting one foot in front of another. No longer could the beauty of the surroundings lift me above the heat of the day. I urged my legs onwards but there was nothing there. I had hit the wall not ten miles into a marathon. Autopilot took over. Repeated gulps of electrolyte drink, a bite of an energy bar, but my stomach was sick of sweetness and it was a fight to keep it down. Even the bottled water that I carried was warmed by the sun and each mouthful induced retching. The 16 mile checkpoint shimmered and beckoned in the distance, but as fast as I urged my legs onwards, it grew no closer. The desert was blunting my ability to judge distance - tempting me with an unattainable vision - I was a donkey following a carrot on a stick. The shade of a Berber tent provided a brief respite from the sun when I eventually struggled into the checkpoint, and then it was back to being scorched - still ten more miles to go. But then, transformation. A primitive dwelling to the left, a battered water well, a tiny cluster of palm trees? Whatever it was, it was just enough to persuade some inner mental harbinger that the desert was not going to be allowed to win. The mind and the body became one again. I broke into a gentle jog. Try and keep going for two minutes. Easy. Okay, let's try five minutes. No problem. In that case, let's see how long I can jog before I have to stop. On and on I went. My surroundings were every bit as barren as they had been earlier when I had struggled so much, but where before everything was uniform and lifeless, there was now shape, texture and colour. I wasted no time at the final checkpoint, pausing only briefly to collect more water. On I ran. As the end approached the ground rose and fell as we passed between mountains, the terrain underfoot becoming rockier and more hazardous, but now I was flying. As I reached the brow of each hill I imagined the finishing line just beyond only to be confronted with yet another rocky outcrop to climb. And then it was there. Half a mile away, surrounded by four coloured hot air balloons. I raced for the line, ripples of applause from the runners who'd finished ahead of me but who now stood and welcomed the rest of us home. Never have I run a slower marathon, but never have I felt such extremes of wonder, pain, elation and despair, all in the space of a few hours. It takes more than a stopwatch to judge a marathon.